Out of the Park Baseball 16 – Officially Licensed by MLB.com, Available in March 2015! Pre-Order Now, Save $5, Get Early Access Plus a Free Steam Key, and a Chance to Win a $500 MLB.com Shop Gift Certificate! That’s right: Out of the Park Baseball 16 is the first entry in our 16-year-old series to feature official MLB.com and Minor League Baseball licenses! That means as soon as you launch a new game, you’ll enjoy official league logos, 30 MLB team logos and jerseys, over 150 MiLB team logos, and even historical MLB logos! But that’s not all: OOTP 16 offers many other new features, and you can pre-order it now through February 15for just $34.99! Get the game three days before its official March release! Screenshots from a pre-beta build. Work in progress. 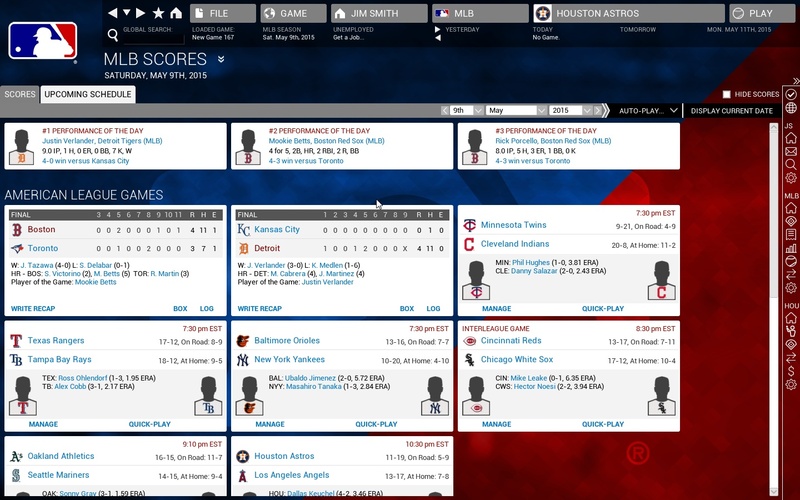 Here are the new and revamped features you’ll find in OOTP 16. As in past years, more surprise features will be added as we get closer to shipping. Our brand new 2015 roster sets include all Opening Day MLB rosters, as well as the complete minor league system down to the rookie leagues. All major league (and certain minor league) player ratings are based on Baseball Prospectus’ industry-leading player forecasting system, PECOTA. The thousands of remaining minor league players are carefully rated by hand by our established research team. Will San Diego’s offseason frenzy pay dividends? Is this finally the year the Blue Jays return to the top of the American League East? Find out for yourself! Last year, we introduced 7 international leagues in Japan, South Korea, Taiwan, Mexico, Cuba, Italy and The Netherlands. This year, we added the Australian Baseball League to that list, along with several independent leagues in the US and Japan. All of those leagues feature real rosters, of course, with countless hours of work invested in researching realistic bio info, statistics and ratings for thousands of real players. We have redesigned large chunks of the team finance system, including new season ticket sales, a team finances screen based on widgets, a new accounting screen, and much more. You’ll be better at the money-related part of your job than ever before. 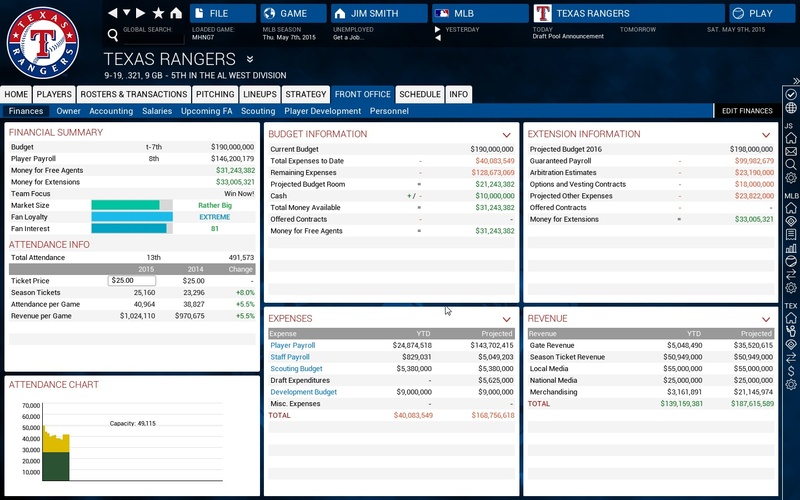 On top of that, we have recoded and improved the entire AI related to finances, resulting in more realistic player contracts and negotiations and more stable long-term team finances. One of our favorite new features this year is the redesigned coaching model. Managers and coaches now have certain personalities and special skills or preferences, which will result in plenty of interesting choices. Do you want the manager of your team (if you decide to play GM-only) to be an easy-going stathead, or do you need a veteran hard-nosed manager who is able to cope with the disgruntled players in the clubhouse? Do you want a pitching coach who is an expert in working with power pitchers, or is your staff based more on control artists who could benefit from a coach who knows how to work with finesse pitchers? You spoke and we listened: We agreed that setting your team’s in-game strategy was a tedious task, so we’vecompletely redesigned that part of the game. Now you can quickly set your preferred strategies and move on to more important matters. Beware, though: If you play GM-only, you’ll find that some managers won’t let you dictate certain strategies. The race for playoff berths is the most exciting part of every baseball season, so we added a new Pennant Chase screen that displays the strength of the remaining schedule and the chance for each team to make the playoffs. We also improved the related news coverage. Who will win it all? Last year we introduced support for 3D stadiums and realistic 3D ball flight, which was a big step-up for the series. OOTP 16 improves on that 3D presentation and includes great-looking 3D models of all 30 MLB ballparks. Rainouts with automatic rescheduling, adding the realism that comes with rain-shortened and cancelled games. Is your bullpen strong enough to handle those late-season double-headers? Every year we wonder if we can top last year’s version of the game and every year we pull it off. We can’t wait to show you more in the coming weeks, including more OOTP 16 screenshots. How long until pitchers and catchers report? Let’s play ball already! Out of the Park Developments: Turning Fans Into GMs! Last month, we launched a unique contest: We asked you, our loyal fans, to suggest our company tagline. We received over 250 entries, many of which had multiple suggestions, and we thank all of you for your great ideas.The winner is Jordan Rosenblum, who suggested “Out of the Park Developments: Turning Fans Into GMs.” Congratulations, Jordan: You’ll receive free copies of all the games we release this year! * Pre-orders must be placed by 11:59 pm Pacific Time on February 15, 2015 to be eligible for the pre-order sweepstakes. No purchase necessary to participate: simply send an email topreorder16@ootpdevelopments.com to enter without pre-ordering. Winners are picked randomly from all entries. For detailed sweepstakes rules click here. ** It will be an online gift certificate, as described in the option on the left at the MLB.com Shop Gift Center. Find detailed MLB.com Shop Terms & Conditions here. *** Steam keys can be redeemed online when the game is available on Steam, which will be shortly after our official release. Instructions to follow. Major League Baseball trademarks and copyrights are used with permission of MLB Advanced Media, L.P.